* this is a sponsored post. However, all text and opinions are of my own, except for keypoints provided by Huggies. 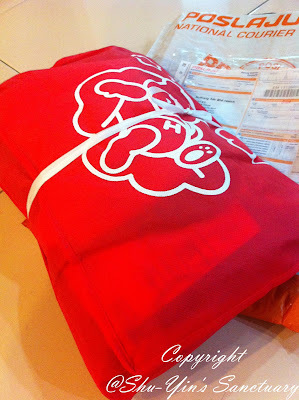 I received a cute little red bundle inside the package last week with some free Huggies Dy Pants samples for my review. In it together is a small denim pouch and a cute little Huggues 'no more stuffy bum' pouch. Too cute. 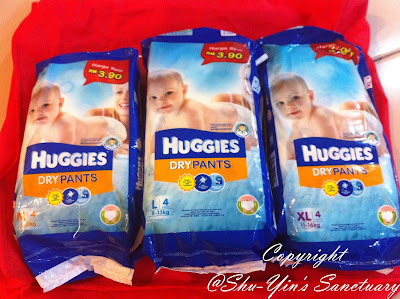 The Huggies Dry Pants samples are in size M, L & XL. The guideline says M is for 5-10kg so I tried that on baby Khye because he was about 9.2kg last week. Khye is getting a little more mobile now that he is almost 6 months old. So with this Huggies Dry Pants, even when he refuses to lie down for a diaper change, I can still change for him while he wiggles on his tummy. "Koyak, Salin & Lepas" (Tear, Change & Release), it is that easy. This is especially easier and more convenient for me in the future when we go out and Khye refuses to lie down for a change. No more fight and tussle over a diaper change on the go. It will be a change for better convenience with Huggies Dry Pants when we go out. Before wearing it, I was a little unsure on which is the front/back of the pants. After some googling, I'm happy to say that the feature 'Wear Any Side Snug Fit' allow the pants to be worn any side while having a snug fit. I love this feature. No more fumbling on which is the front/back. Both sides are the same. As expected size M was a little too fitting when trying to put it on him. But once it's in, it looks snug and fit, not too tight. I let him wear for an hour or so and went to check on him and there were no red marks. It is really snug fit and good. Khye was comfortable in it. It's Soft-Stretch Sides provide comfort and help prevent red marks even when Khye is on the move. Look at Khye doing stretching and he seems very happy wearing the pants. And it doesn't seem to stop him from his normal routine of lifting his legs high up or even wiggling on his tummy. And then Khye had a big poo. As Khye is an exclusive breastfed baby, it's mustard colour poo is rather watery which is normal. 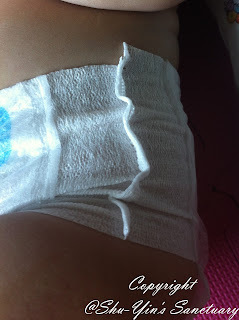 So I really needed a diaper which doesnt leak. I'm glad to say it's Quick Lock System and Double Leak Barriers really helped to stop leaks, but only on the sides near his thighs, so no leaking there. But because Khye was wearing M, which is a little too small for him, he had some leaks up on the back of his diaper. But totally not Huggies fault because when I wore him the size L, no more leaks up there! And the quick Tear Away Side Seams made it a breeze to remove the soiled pants. I also let Khye wore it to sleep. It lasted throughout the night for about 12 hours without any leaks. 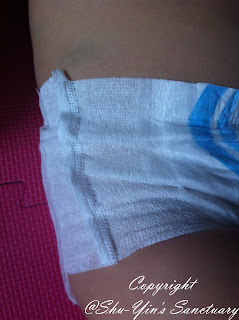 When I removed the soiled diaper the next morning, it was very full and heavy, but still no leak, which is very good. So what is the downside of it? The only one I can think of is that Huggies Dry Pants sizes are rather small. Khye is wearing size M for other brands with plenty of space left for growth, but it seems like for Huggies Dry Pants, size L seems to be a better fit for Khye. But overall Khye is a happy baby with Huggies Dry Pants because it is considered rather breathable for a disposable. So I will certainly consider this brand when we are out and about mainly for its convenience. As I mentioned in my previous post, convenience is the key when we are out and about! You can read more about Huggies Dry Pants on Huggies Facebook page.